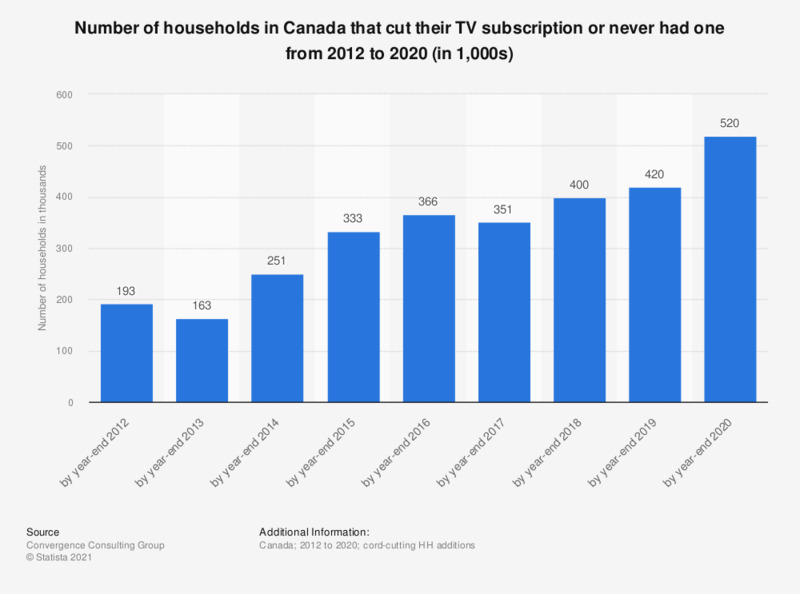 This statistic shows the number of households in Canada that "cut the cord" with respect to their TV subscriptions from 2012 to 2017 and also shows a forecast for 2018. According to the source, the number of households that cut their TV subscription is expected to rise from 357,000 households in 2017 to 406,000 households in 2018. In other words 49 thousand more households in Canada are expected to cut their traditional TV subscriptions by the end of 2018. TV cord cutter households are TV subscribers who cut their TV subscriptions to rely solely on Netflix, Over the Air, Online etc. services. Figures for the period 2011 to 2015 come from an earlier edition of the report. Everything On "Television in Canada" in One Document: Edited and Divided into Handy Chapters. Including Detailed References.